When it comes to sausages or bacon then I am a confirmed brown sauce man, however, every now and again I like a dollop of tomato ketchup and if you want something different than Heinz’s variety then this is worth making at home. It is probably a closer version to Wilkin & Sons (Tiptree) brand. It also helps if you can buy 3kg deep red, really smell of tomatoes, fresh tomatoes for €1.50. I used half for these which produced a 175ml jar and then a third again. The rest of the tomatoes will go to make baked beans. It is a simple one pot so throw the folllowing ingredients into a large pan, bring to the boil then simmer for 2 hours in which time the tomatoes will have broken down and will be ready (when cool) to pass through a food mill. Allow to simmer stirring from time to time and adding a little water if things are starting to look dry. Now the disappointing bit. Store in a cool dark place as it will not be ready until early BBQ season 2018. 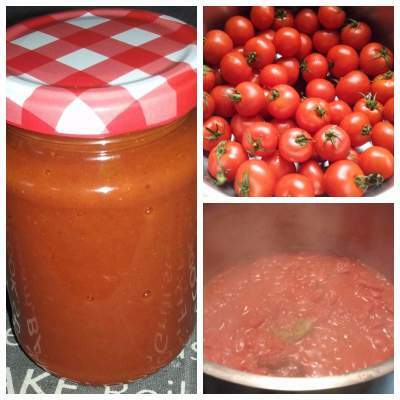 Great, we’ve an abundance of home-grown tomatoes, I never thought about making my own red sauce but seeing this ‘one pot’ I am going to give it a go. Shame that I have to way until next year! Thanks.